My friend, Laurissa, brought a piece of this decadent Paleo flourless chocolate cake for me to sample at the gym last week. It’s, honestly, one of the best desserts that I’ve had in a long time. It’s called a flourless chocolate cake, but it’s more like a decadent large chocolate truffle….the rich and creamy inside with a texture like velvet, smooth, dense and flavorful. 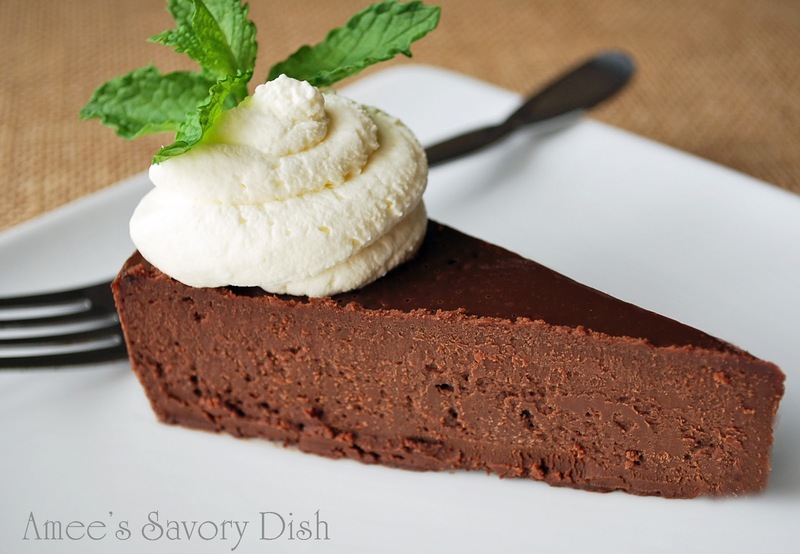 This Paleo Flourless Chocolate Cake is very rich, so a small piece goes a long way. I cannot take credit for this recipe, she got it from Mastering the Art of Paleo Cooking and the only thing that I changed in the recipe was the addition of vanilla extract. I love vanilla in chocolate recipes. Other than that simple tweak, I kept this recipe as is…I didn’t want to mess with perfection. Next time I make it, I may try adding toasted hazelnuts, almonds or walnuts to switch things up a bit. Hazelnuts will make it like a Ferrero Rocher candy. OMG. I’m seriously craving it now. That is my favorite candy of all time. I made homemade vanilla whipped cream to go on top, definitely an added bonus. Kudos to Jessica over at Mastering the Art of Paleo Cooking for this epic recipe. Definitely go visit her blog, but I am warning you, it will make you really hungry! *Cooking tip: Make sure that your springform pan is tightly sealed and wrapped with foil, so no water can get inside the pan while baking. The water bath is essential for good results and you definitely don’t want a soggy cake if water leaks into your batter. The water bath baking process helps to cook the cake evenly and creates the dense, creamy texture you want in a flourless cake. It’s hard to not eat more than one slice of this chocolate bliss! This cake looks incredible Amee! Wow it truly looks and I am sure tastes divine. Totally yummmmmm!!!! I would love a piece right now. So, what is the carb count with this cake? Oh yummers!! Featuring you today! I just made this for my hubs’ paleo birthday feast tonight, and it looks outstanding. I think I’m going to sift some cocoa powder over the top before I serve it. 🙂 Thanks so much for posting! No, it’s not a typo, it’s a very rich chocolate dessert. My “truffle-like” texture is not an exaggeration, it’s decadent! oh, it’s really 18 oz of chocolate? i thought it meant 1- 8oz chocolate. i made it a few days ago with 8 oz of chocolate and it was very rich and delicious. i can’t imagine it being denser! Just took it out of the oven. It looks exactly like the photo YIPPEE! My son is doing Paleo and I am thinking real hard about starting 🙂 this looks wonderful! Thank you! I hope that you enjoy it!! Amee, I made this cake last week and it was loved by all. Even my parents gardener (who definitely is NOT the cooking type) has asked for the recipe. I think next time, I might make it in a square tin and cut it up like brownies to make it go even further! Stealing paleo recipes to put in my personal paleo recipe-book, to make things easier. This cake looks amazing.. Is it 275 degrees fahrenheit or celcius? I made this for my daughter’s 16th birthday and it was fantastic! Thank you! Should I just store it in the fridge? My hubby just got back from deployment. Has a birthday in two days. He is a big chocolate lover.Since his return has not yet indulged on any chocolate. So, I’m really excited to try this recipe! Thanks for sharing! I hope that you both enjoy this recipe Ursula! Please thank your husband for his service to our country! Lots of lucky hubby’s getting this decadent looking treat. It’s on my birthday love list for September 8th. This looks amazing! I recently had whipped coconut cream on a dessert at True Food…I might try this recipe with a dollop of that. Whipped coconut cream would be amazing! Do I bake at 275F or 275C. Sorry just getting the hang of baking. Hi Jaqueline! It cooks at 275 F. I hope that you enjoy it! How long should it be in the water bath? Hi Missey! It cooks in the water bath the entire time in the oven. When it comes out of the oven, let it cool for a few minutes, then remove it from the water bath to cool on a wire rack. My pan leaks and I have everything ready to bake. Do I have to do the water bath? Hi Joyce! It’s important to use the water bath for the best texture. I have to make sure that my pan is wrapped really well in foil before baking or it will leak. I’m going to try this one. Please don’t use Agave, it’s higher on the glycemic index than HFCS and it damages the liver. Also causes miscarriages in pregnant women. Yikes Karin. I haven’t heard those claims before. I don’t use it often, but I’ll be sure and do some research. This looks amazing and so decadent! I will have to try it soon! Thank you Lisa! Let me know how you like it! So glad that you enjoyed it Priscilla! my daughter made this cake for my 75th birthday. BEST ever, I loved the cake! Just made a half batch and added a half a teaspoon of cinni and 1 1/2 teaspoons of espresso. Cooling, can hardly wait till tomorrow to taste it. The batter was tasty. Hope you don’t mind, I shared on my fb page Good Life Bites with a link to this page. Thanks for sharing, I hope that you enjoyed it! I am baking this cake now but when I went to take it out of the oven after 50mins, it was not set and it is still very wobbly after leaving it in an additional 10 minutes … where do you think I may have gone wrong and how long more is it safe to bake without ruining it? I usually bake using Metric measurement not with US Cups but a friend of mine recently bought me a US cup measurng set which I utilised for this recipe. I am baking at 135c which is 275f. Hi Kim! It’s possible that some of the water from the water bath got into the pan if it wasn’t wrapped really tight. This happened to me once and now I make sure that the pan is really sealed with the foil prior to baking. The temperature should be fine. It will look a little shiny and wet when done, but shouldn’t be too soft. It will continue to set when cooled and chilled. I hope that helps! Lovely! We’re much too educated to do foolish, discredited fad diets like ‘paleo’ (see the TED talks that debunked it!) but we love to do flourless now and again; what fun! Thanks so much for this AMAZING recipe! I have made it multiple times & it always turns out perfect and everybody loves it. It tastes spectacular with coconut cream. I have also cut it up & stuck it in the freezer & it still tastes fabulous when it defrosts. Great for last minute company. Mandy, love this feedback! Thank you! The coconut cream is a fabulous addition! This was our Thanksgiving dessert and it was way beyond a hit! It was super simple and amazingly good. Thanks for sharing it! So glad you enjoyed it Kristine!! I’ve made this recipe dozens of times! Everyone who ever tastes it loves it! As per an expecting mom’s request, I’m making this for a baby shower. I was wondering if you’ve ever tried to do two layers and how it turned out? P.S. I always use Trader Joe’s 72% Pound Plus bar with great success. I just found this recipe and I have a feeling it may change my life for the better. One quick question. Will it freeze well? Yes, it should freeze well. I would recommend thawing overnight in the refrigerator before serving. This is very very yummuy!!! I got a big refreshment after taking it.Thankyou for this awesome recipe. Easily 10-12. It’s very rich, so I cut it into small slices.